Base with our last article “3 Reasons You Shouldn’t Own a Marine Aquarium“, besides expensive, a seawater aquarium requires special treatment, in particular with the health of biota therein. Well, there is one way to solve it. You need some saltwater clean up crew that can be cleaning up your aquarium naturally. The saltwater cleanup crew is a composition of saltwater animal that consists of snails, crabs, shrimps, starfish, snail, and any more. It is needed if you want to build a reef aquarium. Having a reef aquarium for your house will give you a fresh and unique look. It will definitely give you beach of nuance that is fresh and fun. But the problem you will face when you have a reef aquarium is the cleaning time. You get challenged to clean the whole tank correctly and clearly. It is rather hard if you do it alone, so the best thing you can do is by adding saltwater clean up crew. 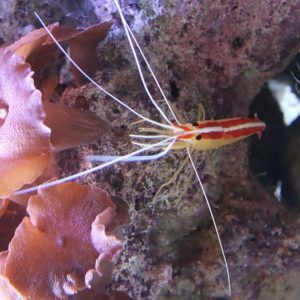 Even though you may face little trouble when cleaning your aquarium, having a saltwater cleanup crew is indeed helped you more. At the first time, you may never know that all of the living things inside the tank is arranged properly. Every living thing that lives in your saltwater aquarium is chosen carefully. Each of them has a task of cleaning as well as to beauty your aquarium. So, you cannot add any fish or any other sea living thing inside the tank. You have to choose correctly then it will give you some benefits. Adding saltwater cleanup crew will complete your reef aquarium existence. Why adding saltwater cleaner crew is important? Having reef aquarium may give you both happiness and whirl. Having saltwater aquarium means that you’ll see some grown algae and live rock. So by adding the saltwater clean up crew, it will help you as algae eaters. You will not have a hard time cleaning your tank since it has been done perfectly by the clean-up crew fish. They will do clean-up the detritus or the non-living organic matter that exist in the tanks. They also do sift through the sand and keeps the algae that live in the water always grow in control time every day. They will act as the natural janitors which mean is really good and better than using the mechanical one. You may get an exciting finding that you can only add saltwater clean up crew into your tank. But something that should have known so well is what type of saltwater clean up crew you should take. You have to choose each of them carefully so it will not get overload and there will be out of food inside the tank. You have to select your team with careful consideration. Think back again that you have to control the water. The living you choose will depend on the gallon water you have. Clean up crew saltwater starting with shrimps, the shrimps can consist of cleaner shrimps. 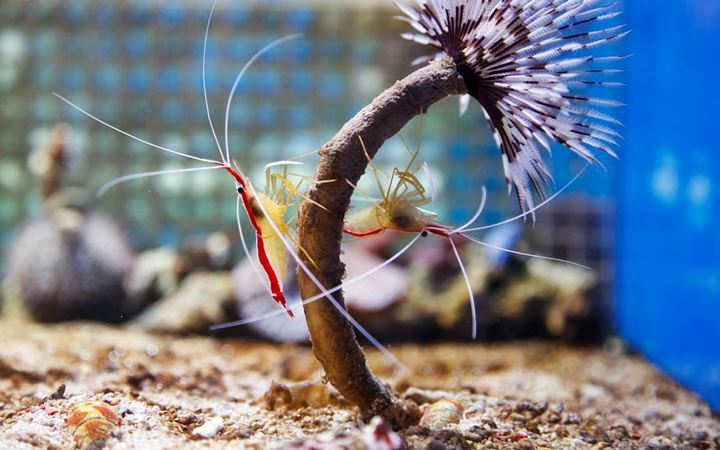 The cleaner shrimps you can choose is Pacific Cleaner Shrimp or Scarlet Cleaner Shrimp, which people usually recognize it as Red or Fire shrimp. This shrimp gives an excellent result of cleaning the leftover food as well as cleaning the parasites. They do control the saltwater as well. Saltwater clean up crew will need crab as well. Some of the favorite crabs that people usually use are the Red-legged Hermit Crab and the Emerald Green Crab. Both of them gives the best appearance yet are beneficial for your reef aquarium as well. What you have to look out when you add the crab is they may give some problem for you as they grow bigger. Once they get bigger, they may make you some obstacle like finding not enough for them in the tank and find no exact size shells. Especially for the Hermit crab, they may kill the other crab to take out their shells due to they do not find any proper shells for them. Therefore, the best way is choosing the small size of the crab. Another one that you can choose is the Sally Lightfoot Crab and the Blue-legged Hermit Crab. Another clean-up crew you will need is starfish. Brittle starfish, this starfish has a black color that looks beautiful. With their camouflage color, they can hide in the rocks and the crevices perfectly. But you have to choose carefully since many people who are not expert yet get wrong to pick Serpent starfish as the Brittle one. The Serpent starfish is not one of the clean-up crew. Besides, this starfish needs more careful handling as well. The saltwater clean up crew will need sea water as well. In addition to shrimp and starfish, the snail is very useful as a saltwater cleaner. The most favorite one is Turbo snail and Trochus snails. The turbo sail has a large size. They can eat algae properly. Although they can help you to control the algae very well due to the big size, it may give you some problems such as have not plenty of food for them, and they may topple the live rock inside the tank. So, it may be much better if you pass the Trochus one than the turbo snail. Trochus has a smaller size. They will not bring your rock down. They are safe, and the happiest thing is they eat the algae so well! Having saltwater clean up crew will give you may beneficial side. But you have to make sure that you already set the right amount of the living things. You cannot add them all at once nor just add them in without having the exact number of quantity. You have to add to carefully. You have to think about your water gallon inside the tank. Use a number of gallons to set the right quantity of your clean-up crew. If you have reef aquarium that consists of more than 50 gallons, then you can count your living things starts from this point. If you want to add turbo snail in your tank, then you can only add one for 50 gallons or not less than 30 gallons. The Trochus that you can add existed at one piece each 5 gallons. The emerald crab that you should put in is one per 25 gallons which means you can add two pieces of emerald crabs for your tank. The hermit crab you can add is one per 5 gallons. You can add more if you want it. IIf they grow large, they may give you problems, but if you can overcome this point, then it is okay. Saltwater cleans up crew like Brittle starfish need to exist. You can give 1 Brittle starfish per 25 gallons. It means you can add two starfishes for your 50-gallon tank. Do not worry if you have set yourself to rear reef aquarium, you will build it perfectly as long as you know about the rule and know about several things that hold an important role. Having seawater aquarium may give you joyful feeling. You can see many beautiful fishes swimming around. But you have to remember that you must add clean-up water since they hold an important role in making your tank looks clean every day.